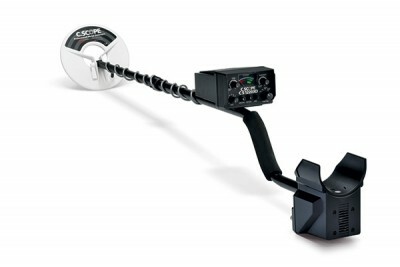 The CS1220R has been designed for professional treasure hunters. We studied the ways that successful detectorists used their machines and we incorporated all that we learned into the software of the CS1220R. The result is a 3-mode operating system reflecting distinctly different ways of working with the CS1220R. G/D Mode is a 2 channel system which allows you to switch rapidly between a MAX DEPTH ''normal'' search pattern and TARGET ID to check the target is worth digging. Meter Search Mode operates as if the ''eyes and ears'' of the detector are extended ready to deliver maximum information about the target underground. The audio channel of the detector operates in maximum depth while the screen provides information about the desirability of the object. Meter and Audio Mode offers maximum target information contained in the audio signal and on-screen. 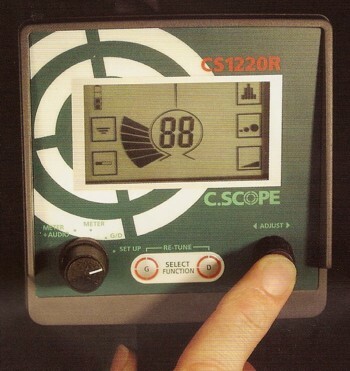 The intelligent CS1220R allocates higher pitched sounds to valuable objects and lower pitched sounds to undesirable targets. You listen for the right sound which means treasure underfoot.